As the pressure to reduce costs continues to rise, innovation, efficiency and automation increasingly become the focus for injection moulding producers in Asia. ENGEL will be demonstrating how to successfully meet such current challenges at Chinaplas 2014, from 23rd to 26th April in Shanghai. All four highly integrated manufacturing cells on display at ENGEL’s trade fair stand combine top performance with maximum energy efficiency while making clear that automation is also beneficial in terms of process technology. An ENGEL duo 900 injection moulding machine with integrated ENGEL viper 20 linear robot will be the focus of the automotive exhibition. With the ENGEL foammelt technology, oil sumps are produced on the large-scale machine with a 9,000 kN clamping force. Under the ENGEL foammelt banner, ENGEL offers turnkey solutions from a single source for MuCell structural foam moulding by ENGEL partner Trexel, from Wilmington, Massachusetts (USA). For the MuCell process, which is no longer protected by licensing fees, the plastic melt is loaded with nitrogen or carbon dioxide and then injected into the mould, during which time the gas expands in the mould cavity. The use of raw materials and the component weight are thereby reduced, while at the same time the rheological properties of the melt improved. This results in dimensionally stable injection moulded parts that are free from sink marks. The manufacturing cell makes it clear how the optimized cooperation between the injection moulding machine and the robot opens up new potential for efficiency. Thanks to the complete integration of the control unit, the injection moulding machine and the robot access the same database and can precisely coordinate their move sequences. For example, the robot can enter the mould area during the mould opening movement, which frequently reduces cycle times. In the electronic and telecommunication sectors, it is necessary to combine energy efficiency with maximum precision and flexibility. And yet, as the demands for quality increase, part sizes are decreasing. In order to meet these requirements while keeping costs low, ENGEL has expanded its ENGEL e-motion series of all-electric injection moulding machines with a small, tie-bar-less variety. 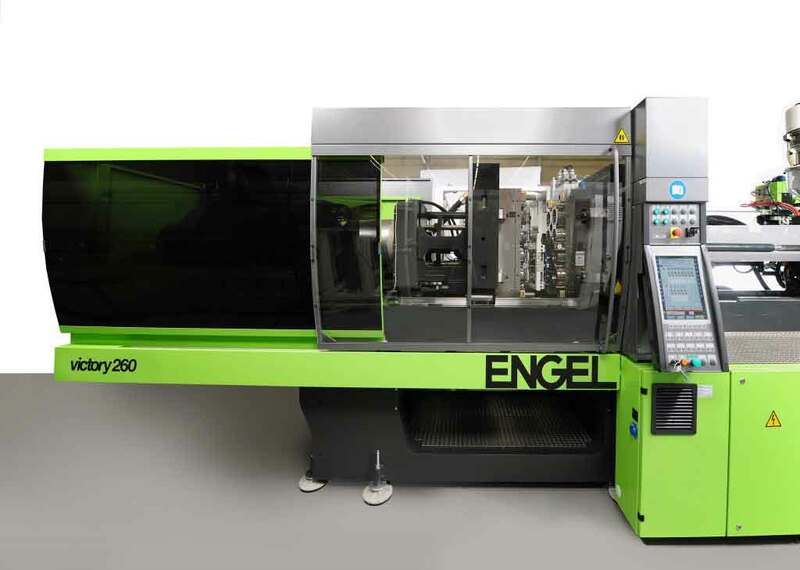 As the first injection moulding machine developed in Europe, the ENGEL e-motion 30 TL with a clamping force of 300 kN is capable of producing optical lenses for mobile devices with a maximum form deviation of just a few µm. Equipped with an 8-cavity mould and an integrated ENGEL viper 6 robot, it will demonstrate this at Chinaplas 2014. For the small, tie-bar-less ENGEL e-motion machine, a new frame concept was developed that enables a really light and very short machine design. With a length of only 3 metres, the ENGEL e-motion 30 TL is the shortest 30-tonne machine with all-electric drive technology on the market. In addition, the barrier-free mould space allows for comparatively large moulds. Both aspects greatly reduce the footprint of the plant, which is an important efficiency factor, especially in clean room production. The business unit ENGEL packaging will also be presenting an all-electric injection moulding machine in Shanghai. 500 ml food containers will be produced on an ENGEL e-motion 440/160 featuring a 2-cavity mould by Glaroform (Näfels/Switzerland). The containers will be decorated using in-mould labelling (IML). The high-performance IML automation comes from BECK automation (Oberengstringen/Switzerland), and the foils from Viappiani (Mailand/Italy). The auxiliary equipment partners are Piovan of S. Maria di Sala in Italy and ef cooling (Dällikon/Switzerland). The ongoing development of the ENGEL e-motion series has increasingly established these machines in the area of high-performance applications in the packaging industry. The newest machine generation is able to achieve cycle times easily under 3 seconds and injection speeds of more than 500 mm per second, thereby combining maximum performance with maximum energy efficiency. The closed system for toggle lever and spindle always guarantees optimal, clean lubrication of all moving machine components. This makes the ENGEL e motion even in regulated production areas – for example, in the production of food packaging – the preferred type of machine. Petri dishes belong to the standard consumables in biochemical laboratories. In order to be able to optically analyze the micro-organisms and cells grown in the dishes, the plastic dishes must have a high level of transparency, optical clarity and a flat bottom. An ENGEL victory 1350/300 injection moulding machine will meet this challenge at Chinaplas. In an 4+4-cavity mould by Plastisud (Castelnaudary/France) eight upper and lower parts of the petri dishes will be produced out of polystyrene in every cycle. The parts are removed in pairs fully automatically, fitted together, stacked and prepared for packaging. ENGEL achieves such a high level of process integration together with its systems partner Hekuma (Eching/Germany). In medical technology, automation plays a decisive role in achieving high levels of process and product safety. That is because manual interventions represent the greatest risk of contamination in the clean room. Thanks to ENGEL bar-tie-less technology, this manufacturing cell even fits within a small area. On the one hand because, thanks to the barrier-free clamping unit, the large mould fits in comparatively small machines. And on the other hand because the automation can be placed very close to the mould. The handling arm can directly access the mould area from the side. Process integration and automation are crucial to increasing efficiency in injection moulding production. At the same time, however, they make the manufacturing processes more and more complex. Making the operation of highly-integrated and automated production processes easier, more comfortable and safer was therefore the declared goal of ENGEL in the development of its new control unit generation CC 300, which will be presented in Asia for the first time at Chinaplas 2014. The new features include the extra-large 21″ multitouch display with a new and clearer structure, separate views for each task, which eliminate operator errors in full-feature scope, and the central control button e-move that gives the operator a feeling for the machine in spite of the multitouch functionality. By being rotated, e-move enables all machine and robot movements to be controlled millimetre by millimetre and in a speed-sensitive manner. “We’re setting a new trend with the CC 300,” says Gero Willmeroth. “The feedback from our test operators has been extremely positive.” One main reason has been that the operators are able to figure out the new control unit immediately. The basic principles that operators appreciated in the previous model have been retained. In addition, user technologies that have since become standard were transferred to the demands of the injection moulding processes – for example, the intuitive gesture controls found in smartphones. Under the ENGEL plus banner, ENGEL showcases its service products and services at Chinaplas 2014 in a separate exhibition area. The main focus is on ENGEL flomo and ENGEL e factory 2. The ENGEL flomo electronic temperature control water distributor continually monitors all cooling and temperature control circuits, thus making maintenance-intensive cooling water distribution manifolds with sight glasses redundant. With its vortex sensors, the ENGEL flomo requires no moving parts and water filters. All the components are made of premium stainless steel. ENGEL flomo is one of the smallest manually configurable water distribution devices with electronic monitoring on the market, and can thus be mounted very close to the mould. This reduces heat loss. With ENGEL e-factory 2, ENGEL sets new standards in production data acquisition. Thanks to the enhanced set of features, the new release of ENGEL’s MES solution can be connected directly to ERP systems such as SAP – even injection molding machines of different brands can now be integrated. Production figures can be observed conveniently in real time from the desk in order to counteract deviations immediately. This results in higher productivity and efficiency in the injection molding production. From injection moulding machines and automation, process technology and mould planning, to training and service, ENGEL offers optimized, turnkey system solutions around the world for the specific needs of individual business sectors and national markets. Local production in Asia ensures the fast and flexible adaption of injection moulding machines and system solutions while also guaranteeing short delivery times. ENGEL is the only western injection moulding machine manufacturer with two production plants in Asia.